Stardust is a fiber blend containing mohair, wool, premium acrylic and a splash of metallic polyester. Especially the metallic polyester is true genius. Usually metallic glitter in yarns are hard and can be really scratchy, but this yarn (and I have no idea how they did it) is soft and fluffy and just gorgeous. Stardust is worked with a 3.0mm to 3.5mm hook and has an impressive 540 meters running length per ball. Stardust is available in 9 solid and 5 long variegated shades, each named after star constellations. 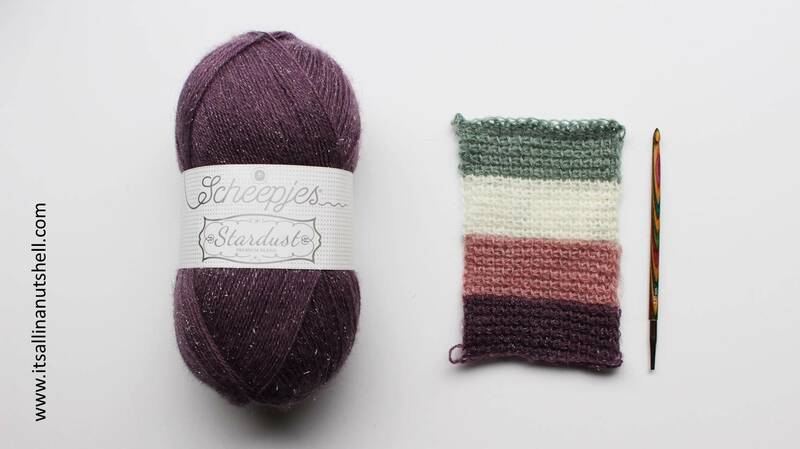 You can get Stardust from Wool Warehouse (expected) or your local Scheepjes Stockist. I am going to use 4 shades of Stardust to participate in the “Discover the Seasons” CAL, a Tunisian crochet CAL designed by Marjolein Kooiman using Scheepjes Color Crafter. Each week the pattern will be shared in the dedicated Facebook group and will be available in English, Dutch and German. At this point it’s still a mystery, but this I know so far. The CAL will last 26 weeks and we will be making a blanket that is about 150cm x 200cm. It is best to use 4 colors and choose one of these colors to be repeated in the border. And that is all I know. I am going into this one pretty blind. Exciting! I know this might disappoint some of you, but this time around I am only going to follow along with the CAL, no videos or anything. Just me learning Tunisian crochet. I am really looking forward to it because other that the simple stitch I have never done Tunisian crochet before. I have made a sample swatch using Tunisian simple stitch (the only stitch I know how to do) to determine the best hook size to use. I bought myself a set of Tunisian hooks a while back and I am really glad I did because now I can easily make test swatches and go up or down a hook size without having to buy just one new hook. I am going for a 5.0mm hook as my reference hook for this project. The 5.0mm Tunisian hook size is significantly higher than the recommended crochet hook size for the Stardust, but totally normal for Tunisian crochet. Due to the way the fabric is worked you need to go up a few hook sizes to be sure that the fabric is soft and flowy. Otherwise you are only wrestling with your stitches and the fabric looks more like a surfboard than anything you would like to use close to your skin. In addition to the reference Tunisian hook size, I will also be using a hook size smaller (4.5mm) and larger (5.5mm); the pattern will stipulate when to go up or down a hook size. I am already loving the feel of my swatch and I have not even started the CAL yet! The Discover the Seasons CAL starts December 9th. I promise I will keep you posted on my progress. Really looking forward to this project. I can’t wait to see what you come up with. I also know just the basic stitch in Tunisian crochet and it will be fun to learn new ones. Hello, you have chosen beautifull colors. Can you tell me what the darkest one is because I can’t see it in the list. Thanx! I have chosen 653, 657, 658 and 659. I believe the color you are asking is 659. Door al die mooie en duidelijke video’s van jou, helemaal in to het haken. Al een aantal dekens (bijna) klaar. Ga graag met je mee in jou nieuwe uitdaging, tunisch haken, ik ken en kan het niet. Succes, wacht vol spanning af.